Civil War. Anyone who has been following the entirety of my 30 Days of Marvel posts know that Iron Man is my number one, no questions asked. I am also a die hard Avengers fan. So to see the loyalties split down the middle in this mostly Avengers event, the X-Men were being heavily policed by Sentinels at the time so they couldn't really participate. You get to see everything, Captain America fighting his way past S.H.I.E.L.D. agents, Iron Man beating the crap out of Spider-Man, Peter Parker revealing to the world who he really is, Dr. Strange praying it all comes to an end, The Punisher putting down the hammer and bringing the sweetest vigilante justice ever, Tony Stark, Reed Richards and Hank Pym cloning Thor, and the ultimate culmination of the entire event, the death of Captain America. The story really stands up, as I find myself revisiting the main series about twice a year, which is saying something as most cross over events have their main issues being used as nothing but giant splash pages with very little substance. 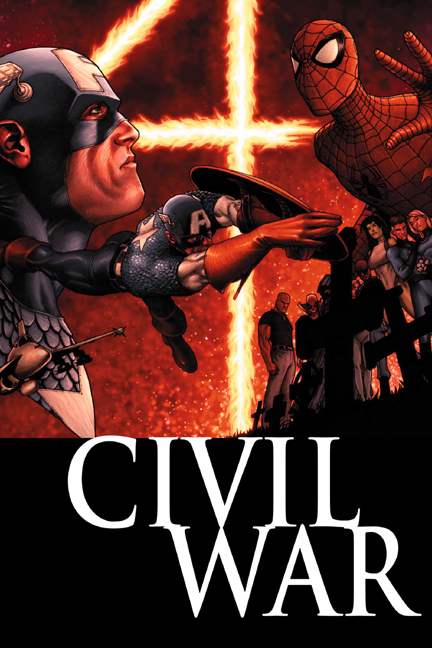 Civil War defies this mainstay and presents story at its forefront, showing off Mark Millar's fantastic writing in a way that brought the entire Marvel Universe to it's knees, helping shaping it for the future we are reading now.